"Serve warm over vanilla ice cream, or serve on the side with Rhubarb Muffins." In large skillet, melt butter over high heat. 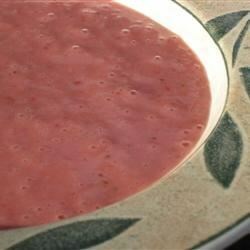 Stir in rhubarb and sugar and continue to cook, stirring constantly, until tender, 5 to 10 minutes. Serve warm. This is really easy to make and I added strawberries too--I meant to serve it with yogurt or over ice cream but ended up spreading a lot on toast and it was really good!